The term 'boron' refers to the oxide B2O3. 'Borate materials' thus contain B2O3, they source it to glass-building during melting in the kiln. Boron is actually the potter's friend (because of his electronic-controller-equipped kiln) while as the same time it can be a scourge in industry (because they are forced to fast fire), we will see how that is. Boron is a flexible oxide because it is a glass (can substitute for SiO2, with some loss in hardness of course, and combines readily with bases and colors). It is also a non-toxic flux with a low thermal expansion. Boron is not a common mineral on planet earth. Most of the world's reserves are in Turkey, but also in the US, Chile, Russia. Insoluble boron is sourced by frits, Colemanite, Ulexite and Gerstley Borate (actually Gerstley Borate gels the slurry so it is partially soluble). Almost all low temperature glazes owe their existence to boron-sourcing materials. Other than lead (which is superior in almost every way), no other commonly available flux will melt a glaze at cone 04-06. But boron-containing frits and raw materials will. Thousands of different boron frits are available around the world (containing from 1 to 50% or more B2O3), people and companies often use them without a second thought to the magic of the boron in them. It is common for glazes to contain up to 90% frit, adding just 10% kaolin for the slurry properties they need in manufacturing. However many low fire glazes can be made using much less frit and adding materials typical to higher temperature glazes (like feldspar, silica, ball clay). Gerstley Borate has long been used in North America as a source of B2O3, it actually contains a much higher percentage than any commonly available frit. However only potters are willing to endure the process issues it introduces. Boron low fire glazes are certainly not without their problems, these include clouding (from micro-bubbles), crystallization (boron blue), dimples, pinholes, etc. However these can generally be solved by firing curve alterations and changing materials or chemical balance. Because boron has such a low thermal expansion its glazes are quite adjustable in thermal expansion (e.g. by lowering and raising Na2O). 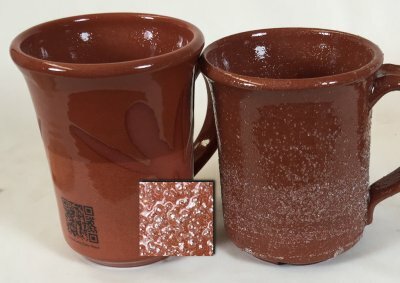 The fast fire techniques that increasing numbers of manufacturers use in recent years are not practical with low fire boron glazes (they melt to early and have too many defects), but potters can adapt. The big benefit is that brilliant colors are so much easier to produce. In fact, by adding a little frit to their bodies and being patient and creative with firing curves (using an electronic controller), low temperature potters can produce stoneware! Many people that have made and used middle temperature glazes (cone 4-8) are unaware that B2O3 is the key fluxing oxide (in most glazes) and that it makes melting possible at cone 6. No combination of common raw flux-sourcing materials like feldspar, nepheline syenite, calcium carbonate, dolomite and talc mixed with silica and kaolin will melt nearly enough at cone 6 to produce a functional glossy glaze. At first it might seem that since Li2O and ZnO are super-fluxes we could simply add a little of them (e.g. 5%) to high temperature glazes (already fluxed employing the standard oxides Na2O, K2O, CaO and MgO from the above materials). 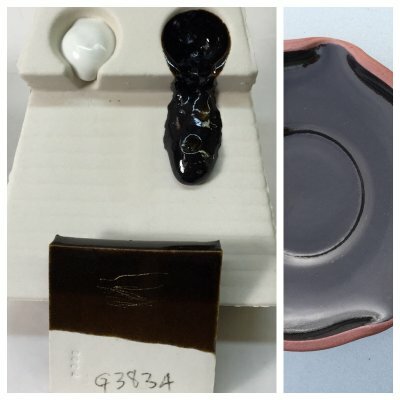 While that can actually work and be tolerated in some circumstances, their source materials are not only expensive but can be troublesome in the glaze suspension, producing bubbles, flocculating the slurry and producing cracks on drying (which lead to crawling). In the firing glaze they can volatilize and can dramatically affect the colouring mechanism of stains and metal oxides. In the fired glaze they can introduce leaching issues. So, not surprisingly, the entire ceramic and enamel industry have traditionally relied on the flux B2O3 (boron) to make good base glazes at low and medium temperatures. However larger scale manufacturers that fast fire (and fast cool) must also minimize B2O3 content (to avoid its early melting and glaze defects that produces in the absense of soaking and slow cooling). They are thus forced to find ways to use more ZnO and Li2O. But potters with their electronically controlled kilns and more patience are once again the winners. They have the time to soak firings are temperature, cool them a little and soak again, and control temperature fall as far as they want. These factors can transform boron glazes into something industry could not produce. 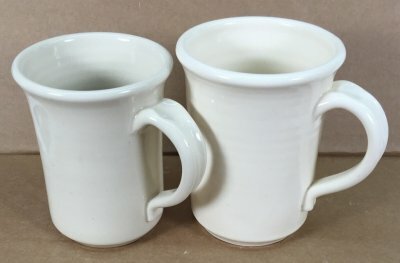 The porcelain mug on the left is fired to cone 6 with G2926B clear glossy glaze. This recipe only contains 25% boron frit (0.33 molar of B2O3). Yet the mug on the right (the same clay and glaze) is only fired to cone 02 yet the same glaze is already well melted! What does this mean? 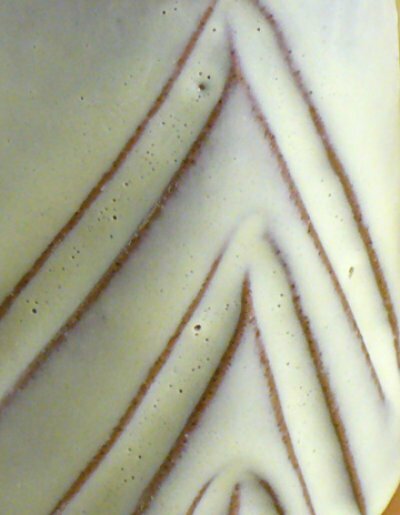 Industry avoids high boron glazes (they consider 0.33 to be high boron) because this early melting behavior means gases cannot clear before the glaze starts to melt (causing surface defects). For this reason, fast fire glazes melt much later. Yet many middle temperature reactive glazes in use by potters have double the amount of B2O3 that this glaze has! These GLFL tests and GBMF tests for melt-flow compare 6 unconventionally fluxed glazes with a traditional cone 6 moderately boron fluxed (+soda/calcia/magnesia) base (far left Plainsman G2926B). The objective is to achieve higher melt fluidity for a more brilliant surface and for more reactive response with colorant and variegator additions (with awareness of downsides of this). Classified by most active fluxes they are: G3814 - Moderate zinc, no boron G2938 - High-soda+lithia+strontium G3808 - High boron+soda (Gerstley Borate based) G3808A - 3808 chemistry sourced from frits G3813 - Boron+zinc+lithia G3806B - Soda+zinc+strontium+boron (mixed oxide effect) This series of tests was done to choose a recipe, that while more fluid, will have a minimum of the problems associated with such (e.g. crazing, blistering, excessive running, susceptibility to leaching). As a final step the recipe will be adjusted as needed. We eventually chose G3806B and further modified it to reduce the thermal expansion. These are the inside uppers on two mugs made from the same clay with the same clear glaze. The one on the left was fired in a large electric kiln full of ware (thus it cooled relatively slowly). The one on the right was in a test kiln and was cooled rapidly. This glaze contains 40% Ferro Frit 3134 so there is plenty of boron and plenty of calica to grow the borosilicate crystals that cause the cloudiness in the glass. But in the faster cooling kiln they do not have time to grow.